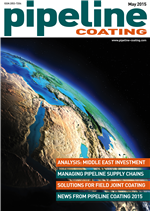 The May 2015 edition of Pipeline Coating is now available for viewing. Just click here to see the magazine in full, completely free of charge. Global industry news including, Gazprom moving ahead with its Turkish Stream project, Polarled gas pipeline laying underway in Norwegian Sea, Shawcor’s comments on its Q1 results, and Kinder Morgan’s response to Palmetto Pipeline setback. The latest coating materials and equipment news including, potable water approved coatings from Axalta and an internal coating for high temperature risers from Ceramic Polymer.